Park visitors and supporters are beginning to see the start of Guild Park’s return to its full potential and redevelopment as an asset to our community, to our city and to the world. Ongoing progress, this Fall and Winter, at Guild Park sets the stage for even more improvements and activities at this unique site. a testament of the impact Guild Park has made on the lives of park visitors and park professionals, local residents, as well as artists, nature-lovers and history buffs. gain support from the growing number of park visitors’ and advocates who appreciate Guild Park’s past and potential. Friends of Guild Park will continue working collaboratively to bring “whole park thinking” and best practices to this special, 88-acre public space – Where Art Meets Nature. This newsletter includes details about Guild Park issues and activities. For the latest information, I invite you and your friends to the Spring Party for Guild Park on Saturday April 16 at Scarborough’s Qsiss Banquet Hall (full details below). I look forward to welcoming you personally along with our many members and Guild Park supporters. Join Us April 16th for The 2nd Annual Spring Party for Guild Park Mark your calendars and be sure to come out for a fun-filled afternoon focusing on Guild Park. You won't want to miss it. It’s a party where you can show your support for Guild Park and get lots of information about this season’s park activity. This event is also your opportunity to meet informally and chat with officials from Dynamic Hospitality. They’ll be attending to give the latest update on the progress they’re making on Guild Park’s new restaurant and events facility. Also, you’ll hear some amazing insights about Guild Park’s new Monument Walk from the landscape architect, Real Eguchi, who completed the project last year. During the party, Friends of Guild Park will announce the schedule of Guild Park events for the coming year. By attending, you’ll be among the first to know what’s happening at the park in 2016 and beyond. All this, plus live jazz, refreshments, cash bar and a silent auction. It’s celebration for everyone interested in Guild Park’s past, present and revitalized future. All proceeds go toward upcoming activities and improvements at Guild Park. Lots of free parking on-site. Admission at the door is $35 per person. Save $10 by getting your tickets in advance for just $25 available now on our secure website! Click here and save almost 30%! Another Guild Park Milestone – 10,000+ in 2015! Walking Tours, seasonal shoreline clean-ups, movie nights and other special events held by Friends of Guild Park. Since 2013, more than 30,000 visitors have come to Guild Park to enjoy this unique public park where Art Meets Nature. Considering the limited facilities at the site, park volunteer organizations, in collaboration with park officials, recognize dozens of ways to improve visitors’ experiences, while protecting Guild Park’s unique natural and art-related features. Friends of Guild Park, working closely with other park stakeholder groups, continues to advocate and work with park officials to make progress on these and other improvements. Dynamic Hospitality and Entertainment is the private partner selected by the City of Toronto to operate Guild Park’s new $20-million restaurant/event facility. Dynamic officially took responsibility of the park’s restaurant site Feb. 20, 2016. Prior to that, the City spent months preparing the area to remove hazardous materials and remove the non-heritage sections of the Guild Inn structure. 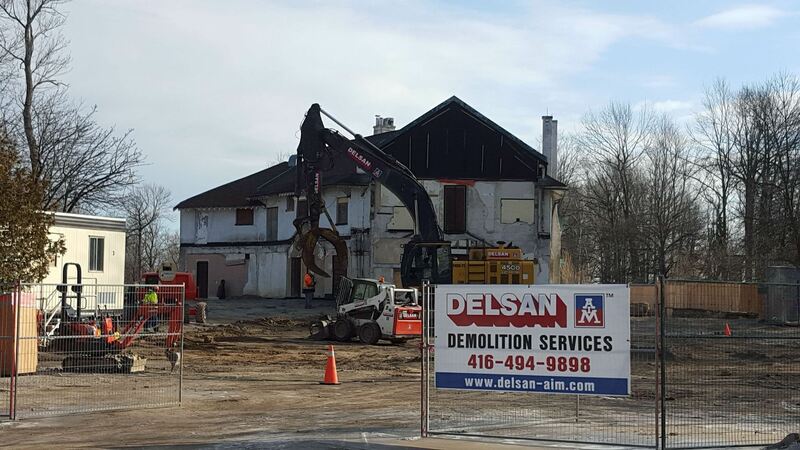 Dynamic will now be responsible for restoring the 1914 building that served as the original Guild Inn and constructing two more buildings as part of their operation.t. Dynamic expects to start its work in early April, with construction scheduled to take about 13 months. Already, Dynamic and city officials are looking ahead to ensure the new event and hospitality facility generates local jobs. Representatives from the neighbourhood improvement group, East Scarborough Storefront, recently raised the issue of local employment – especially entry-level positions – with officials from the City of Toronto and Dynamic. It was agreed to develop hiring policies that will encourage local residents to work at the park’s new facility. Storefront’s advocacy builds on the legacy of the old Guild Inn. Many Guild Park visitors continue to recall how they earned their first paycheques as waiters, kitchen help and at other jobs on the site. The City of Toronto’s electronic version of guided walking tours – the Discovery Walks program – is coming to Guild Park. Our park was recently selected as one of five new sites across Toronto to be added to the City’s growing collection of on-line tours. These apps are developed in conjunction with the social media program at Ryerson University. Five existing Discovery Walks, mainly focused on historic sections of downtown Toronto, are already operating. The City’s Park Partnership Unit of the parks department is responsible for this project. The unit will work with Guild Park walking tour volunteers to move this project forward. To find out more about this project and see the current roster of Toronto Discovery Walks online, visit Discovery Walks. More than 80 people – long-time Guildwood residents, arts professionals, new Canadians, volunteers, parents and teachers – had an opportunity to give their views about future arts programs at Guild Park at a preliminary public meeting in December. At the first Community Consultation on Arts and Culture at Guild Park, people were encouraged to have a say about the site’s potential as a modern version of The Guild of All Arts. This was the historic artists’ community launched on the property in 1932 by its former owners, the notable Canadian philanthropists, Rosa and Spencer Clark. This arts and culture “revisioning” project is managed separately from the $20-million restaurant/event facility construction now underway at Guild Park. Yet both are closely inter-related. The restaurant development team has announced that some form of arts/cultural facilities will be included in the new restaurant facility. The decisions made about the size and scale of heritage displays and art galleries inside the restaurant will affect the type of arts facilities established elsewhere in Guild Park. the pioneer “Osterhout” log cabin near the Bluffs. Funding: Apply money from the Clarks' estate, plus the insurance proceeds after fire destroyed Guild Park's Studio building in 2008, to the site's new arts programs/facilities. Art and Artifacts: Return the Clarks' notable art collection, historic memorabilia, such as letters, photos and other items now in storage for display in the new facilities at Guild Park. respect the site's legacy as a centre for professional artists that also welcomed visitors from around the world; Encourage excellence in arts activities. Renaming Building 191: People suggested various names for "Building 191" which will be the arts and cultural hub at Guild Park. Possibilities included "The Guild of All Arts"; "The New Studio Building"; and incorporating the Clarks' name in the building. Cooperative Operations: Develop for Guild Park's arts programs an innovative operating "model," based on the cooperatives that have been successful at other "art parks" in Toronto and elsewhere; coordinating new arts programs at Guild Park with those that exist elsewhere in Scarborough and Toronto; operating future art programs in a cooperative way with professional artists and arts organizations. Improvements: Enhance the visitor experience by adding public washrooms and making drinking water available at Guild Park; enhance outdoor performance space at the park's unique marble Greek Theatre with backstage facilities and appropriate sound/light and other stage equipment. protect the park's natural features. "We have a blank slate," said Nadira Pattison, the City of Toronto's Manager of Arts Services, who welcomed meeting participants. "We're limited only by our imagination." City officials will continue to gather Input about the type of arts/culture programs to be offered at Guild Park in early 2016. To provide your comments can complete the online survey created by the City of Toronto here. The Toronto Public Library board recently decided to keep the Guildwood branch at its plaza location for the next 12 years. Many people had suggested Guild Park as site for a new and larger community library. The existing Guildwood library is a 3,000 sq. ft. facility that opened in 1973. Local demand has outgrown the library’s facilities and it now “falls short of the current standard for neighbourhood branches,” according to a January 2016 library staff report. The Toronto Library board agreed with the report’s finding that the existing rented branch at the Guildwood Plaza “is the most desirable in terms of location,” noting the plaza is “a real community focal point” with parking and easy access by seniors. City library officials decided to renew the lease for the current spot until 2028. During this time, the branch will gain an extra 1,500 square feet of space. The library staff report noted that after this expansion, Guildwood library patrons will remain underserved based on current use of the branch. The decision to keep operating Guildwood’s library as a small branch outside Guild Park puts extra importance on plans to bring new community/arts-related facilities to Guild Park, most notably the redesign of the building at 191 Guildwood Pkwy. This advisory group of city officials and volunteers was set up to oversee progress on the 32 park priorities identified in the Guild Park Management Plan. The group includes City decision-makers, volunteers from the major Guild Park stakeholder groups – Friends of Guild; GVCA; the Guild Festival Theatre and the Guild Renaissance Group and representatives from the public. Park Trails – creating an overall park plan for improving/managing trails (location, accessibility, signage, lighting). Cultural/Heritage – returning arts programs with appropriate facilities; protecting outdoor artifacts; conveying Guild Park’s legacy through exhibits/events. Horticulture – caring/enhancing park gardens; encouraging public stewardship. he City of Toronto’s park trail initiative by Toronto’s Parks, Forestry and Recreation dept. Guild Park’s “Cultural Precinct” update by the City’s Cultural Services division. These multiple initiatives continue in the absence of an integrated plan and priorities for all of Guild Park. Achieving progress on so many related, but separate plans, continues to be complicated. More than 15 government agencies, departments or divisions are involved in Guild Park operations. The recent decision not to build a new library at Guild Park (see item above) was likely influenced by the complexities in using the site and that no recognized “champion” exists to promote Guild Park as a potential hub of sustainable cultural and other activity. Many Guild Park supporters, including Toronto Mayor John Tory, recognize that Guild Park has operated for decades without a specific decision-making process that includes clear responsibilities and resources. Friends of Guild Park and other stakeholder groups continue to advocate for this. 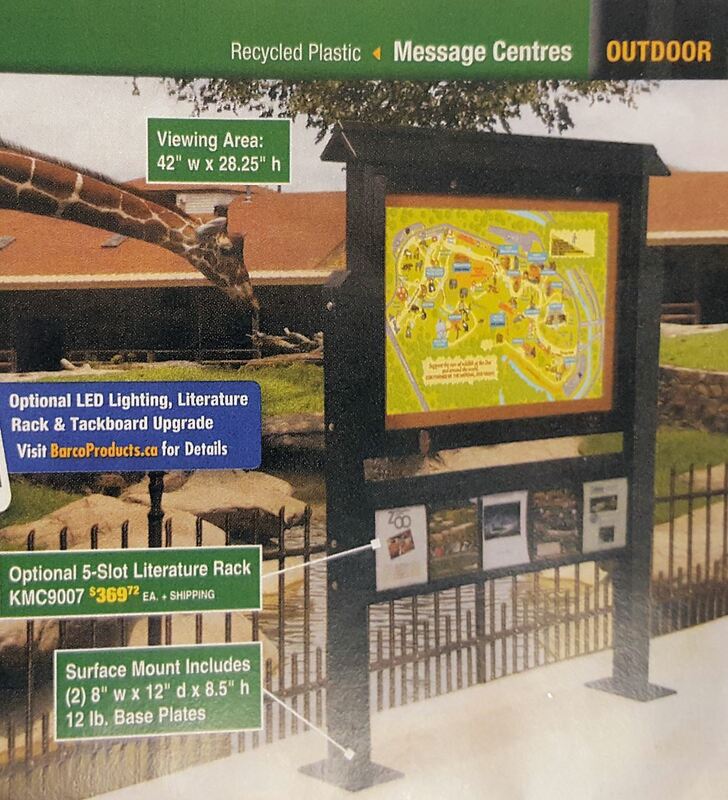 Two new visitor information signs are expected to be installed at Guild Park later this year. The design will be similar as at other major city parks and include a map of Guild Park. Confirmed locations will be at the Livingston Road park entrance and along the new Monument Walk within the park grounds. Repositioning may occur after the current round of construction in the park. Plans are also underway to build a raised wooden walkway in certain areas of the park subject to wet ground. We’ll share more information as it become available. A long-overlooked feature at Guild Park is having the site commemorated with an official heritage plaque. The information markers now displayed on the 88-acre site today were installed either by Rosa and Spencer Clark, who used to own and operate the property, or by the Clarks’ friends. Friends of Guild Park has begun the process of applying for a provincial plaque from the Ontario Heritage Trust. We also plan to launch a similar application through the City of Toronto. For each plaque, the public must raise about $8,000 in additional funding to cover installation, maintenance and administration expenses. Fundraising will begin once Guild Park’s plaque applications are approved. Imagine attending some amazing events at Guild Park in 2017, including the unveiling of a heritage plaque. What ideas do you have? 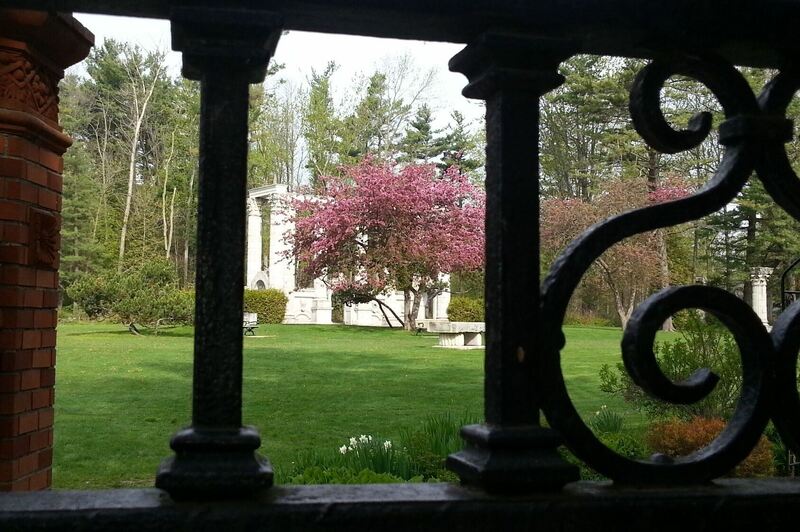 Share your thoughts at info@guildpark.ca. We look forward to keeping everyone posted. Watch for details as we get closer to the spring blooming season. Book Your Own Tour of Guild Park! Friends of Guild Park now offers customized walking tours for groups and organizations. Schools, church groups, service organizations, businesses and others have all enjoyed the insights and history provided during these guided “walk-abouts” around the grounds of historic Guild Park. Members and supporters of Friends of Guild Park are welcome to join in on these activities. It’s a great way to learn more about Guild Park, share your ideas and contribute some time to an important cause – the long-term revitalization of Guild Park. Volunteers are invited to join in at our events, “greet” other participants, help with planning and registrations and provide support. For students, Friends of Guild Park activities qualify for community hours. 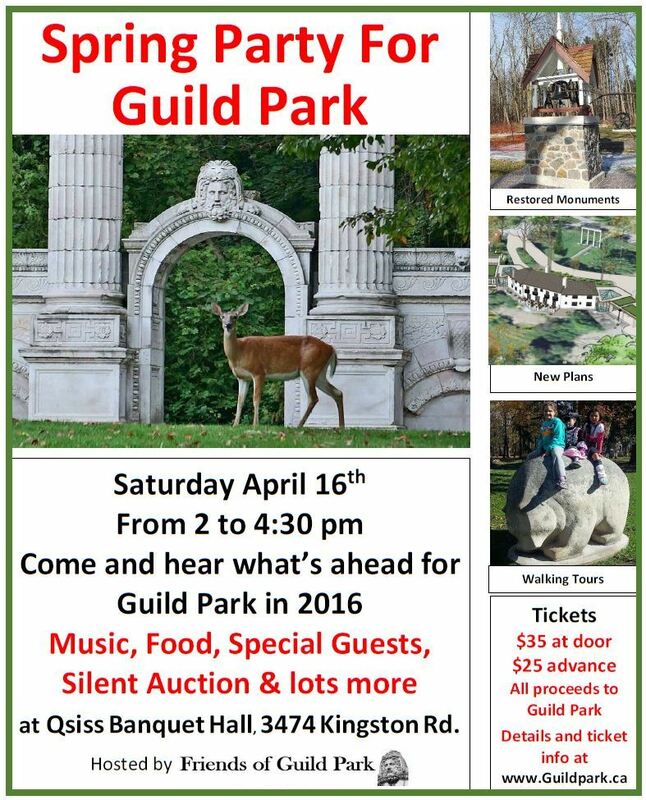 For details about how to volunteer, contact us at info@guildpark.ca or leave a message at 416-816-9701.